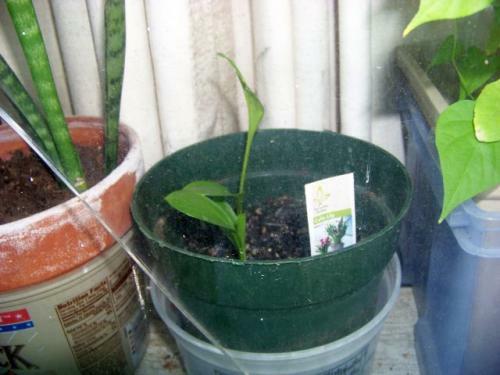 I took the calla outside for awhile today, to get some fresh air and sunshine, it did not get direct sun for too long I put it in a shady spot and watched it, then I brought it back in and put it back in the window, how long do you think it will be before tall enough to bloom? I have seen them fairly small and blooming in the stores. They are put under special lights though. If you have a area outside in a shady area I would leave it outside during the summer and just keep it well watered. My solid leafed ones winter outside in the ground and have already bloomed. They are right up against the foundation. My spotted leafed ones are just now coming out of the ground and may not bloom...too cold last winter and they are well away from the house.